Throwback Thursday - Jaws (NES) — GamingWithSwag.com - Dads By Day, Gamers By Night. I grew up on Jaws, my cousin Phil and I watched it religiously. When we went to our Grandparent’s beach house we rented a Jaws movie almost every time (that or some weird cartoon movie like The Great Bear Scare), which wasn’t exactly wise as a fear of sharks is my only diagnosable phobia. When Jaws came out on NES in 1987 I imagine it didn’t take long to become part of my library. 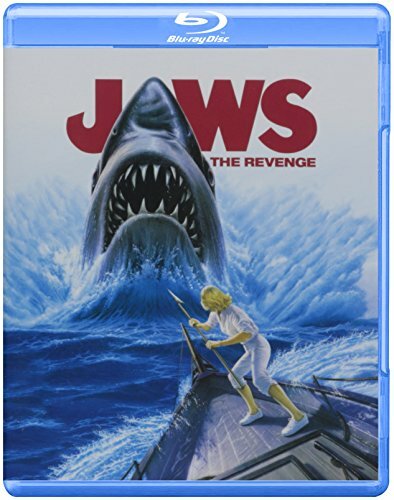 The game is based mostly on the underappreciated but still somewhat terrible film Jaws: The Revenge oddly starring Michael Caine about which he said “I have never seen it, but by all accounts it is terrible. However, I have seen the house that it built, and it is terrific.” The game however is awesome. Gameplay starts in the boat which allows you to traverse a map of the islands and while sailing you can hit something or Jaws himself and be thrust into an underwater harpoon battling adventure where you try not to die and collect Conch shells while you are plagued by stingrays, jellyfish and of course sharks. The conch shells are what the scientists were studying in the movie, but in this game they serve as currency. As you go back and forth between the two ports on the map you can trade in Conch shells to increase your power level which makes it possible to hurt Jaws enough to defeat him in a tense boat spearing mini-game. The game can be frightfully cruel. If you hit something while next to land you have to do battle in the shallows, which provide limited room to maneuver and may be more terrifying than the new Blake Lively film The Shallows. The longer you play the game the crueler it becomes. Jaws will strike the boat more often, the jellyfish will start to seek you more aggressively, and whenever you die you lose your precious shells and some power. However, if you are quick and avoid death you can level up and drop Jaws in less than 15 minutes making it the perfect quick play game on NES. I love the variety of the game, like the silly plane mini-game that pops up after defeating special mini-Jaws sharks where you drop bombs on jellyfish swimming in strange patterns below you in the water to collect Conch shells. And the highlight of the game is the final battle where you have to track with a wildly swimming shark fin and shock him at just the right distance from the boat so that you can spear his throat with the bow of the ship. It takes a lot of trial and error to get that distance right and if you take too long or miss 3 times you have to go back and fight him again in order to get another shot at spearing him. Many have never learned to conquer the game and I find that after all of these years my skills in this game have not wavered. I hope that when I am 60 I will still be able to dust off this game and beat it in under 20 minutes and send the great shark bleeding to the bottom of the ocean.